Click and Make-Up Beauty Blog: Christmas Sales Bargains! I hope you all had a fabulous Christmas and Boxing day with lots of family time, feasting and happiness! I braved Westfield London for a couple of hours yesterday but went on a serious Black Ops mission there this morning. I set my alarm for 7.30am but of course slept through it until about 9, but I was on my way within half an hour fully kitted out with backpack, trainers and list of everything I needed by shop. I can practically rotate a 3D image of Westfield and every shop/bathroom/restaurant in it in my head...if you ever get lost there and need directions, you want to bump into me! I figure it's best to post this sale bargain haul first in case there's anything you fancy that you wouldn't want to miss out on, and then I'll do one on the goodies Santa brought...I do know a lot of elves but I seriously got bumped near the top of the "good" list this year! My Insolence is a softer, more wearable version on Insolence by Guerlain. I absolutely love it and finished up my first bottle of it over a year ago, so when I saw it going for £21 ish for the set in Debenhams I had to grab it! I went a bit overboard and got a third perfume. I really can't justify this one, but it has been on my wishlist for ages. I loved it from first whiff - to me it smells like a feminine version of Dior Fahrenheit for men, which is my all time fave scent on a guy (take note Kev!). Lots of violet and a nice strong but not sweet fragrance for work. It's normally about £35 for 30mls. I adore the packaging, it's very sleek, but the bottle doesn't really capture my imagination. House of Fraser have a tonne of half price perfume sets and reduced YSL makeup, definitely work a look. The Westfield one has loads of gift sets of Vivienne Westwood's Naughty Alice for about £25, they're sold out online so I can't check the price, but it was a good deal. I spotted this 100% pure silk robe on the M&S website yesterday for £25 down from £110! I didn't want to take a risk on the sizing, and since I had to return something to the shop for - what would you know?! - £25, I took it as a sign from the gods. I found only one in the whole store and it fit perfectly! The embroidery is just beautiful. I think I'll hang it on my wall as a piece of art as there's no way I want to slob around the house getting stains on it! They had quite a few online yesterday but I checked today to the post the link here and they're all gone! So best to check in your local store for it. I got a bit robe happy and also picked up this pale pink light robe for summer - one I can slob around in. It's still for sale on the M&S website for £19 down from £45. I do like it but now have three dressing gowns (I got a fluffy one for Christmas) so I might take it back. You can see what it really looks like here. Lancome Hypnose mascara is definitely a holy grail item for me, and low and behold, just as my first tube of it has dried up, I spotted a great deal on it in Boots. For £14 something I got the 'Precious Cells' version which is supposed to nourish and help grow my lashes. I doubt the claims but the mascara itself is amazing. The Bi-Facil eye make up remover is the best out there, but I use the No7 dupe as it's too expensive. The Kohl pencil is truly the best I've tried and I have the full size of it. Lining your upper waterline is a doddle with it, not to mention the easy parts of your eye. The Precious Cells version is sold out on the website but you can still pick up the regular version for £13.33. Moving away from beauty items, I got this cute mini rucksack from Sports Direct as they wouldn't refund my postage from the online shop (such a cop out when they claim that their high street and online retail operations are entirely separate...they say it just to rip people off!) for a cute bear hat which sadly didn't fit. 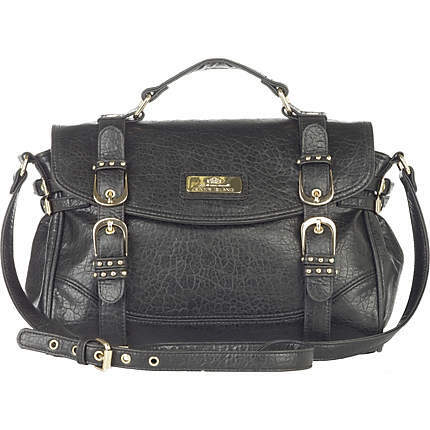 So I swapped it for this bag, which was £9.99 down from £24.99. I always try to be glamorous on holiday, but sometimes I do tend to go off on all day hikes (not shopping, okay?!) and need to carry a lot of junk with me, so I have to face facts and carry an appropriate bag! I finally found a cute address book that's big enough to fit everyone in but not to heavy to carry on hols. I'm done with sending loads of texts asking for addresses every time I'm abroad and about to send a postcard! This one was £4.99 in W H Smith. Pardon my slightly demented look (but what else would you expect from this sort of hat wearer?!). I spotted this one in River Island a while ago but at the time wanted a woolly hat, plus I think £19.99 is expensive for it. Since then I've realised I have an unnaturally fat head and nothing fits, except my little tiger friend here. This will keep me toasty in Jan and Feb. If I wear it with my Dominic the Donkey gloves I'll probably get carted off to a secure institution! I'm wearing the pink fluffy robe I got for Christmas...it's going to be my winter uniform thus forth! I had a few quid left on an old House of Fraser gift card so I picked up a Linea room fragrance diffuser oil refill for the set my mum got me for Christmas along with some candles. They're apparently Frangipani but don't smell entirely like Elemis' Exotic Frangipani products, but nice enough. I got 50% off both so they came to £6 in total. And I just had to grab this Terry's Chocolate Orange in W H Smith for 99p! My mum never gets them but I think they're really Christmassy! YUM! As if I hadn't had enough materialism for this year I'm still on the look out for some pink check or candy stripe warm pajamas, but everywhere I've looked is sold out! I'm going to Primark in the morning for fingers crossed! I have my new Beauty and The Beast DVD on in the background...it brings me back! What sale bargains have your discovered?! Don't forget to enter my giveaway of the Urban Decay Book of Shadows Vol. III which is sold out in most stores now! It closes on January 6th 2011. Oh my gosh! That is so enviable! :) I love the Balenciaga one. It's a dream of mine to have a bag from Balenciaga. lol. oh you got some amazing bargains! Also got the Insolence perfume but the stronger version of it and also a Juicy Couture perfume. Very tempted to buy the Lancome set now! @Toni - It's lovely isn't it, and so distinctive...I'm not one for designer bags as I like a cheap thrill more often, but if I were to get one it would have to be Balenciaga! @About Makeup Savvy - I couldn't decide to get the stronger one or not...my friend has it and I always love it on her...hmm, maybe if it gets reduced further!